The Dewalt DCN660 Nailer is the new 2nd Fix Brushless Finish Nailer, a new addition to the popular Dewalt XR Li-ion range. Here is a summary of the new DCN660 Nailer and why it is a must have power tool for interior decorative trim applications. The innovative, new DCN660 2nd Fix Nailer features a belt-free brushless motor and flywheel which provides improved overall performance, with greater power delivered over a longer lifespan. The power of the brushless motor and the rapid acceleration that it provides means that the DCN660 Nailer is capable of firing up to 4 nails per second in Bump Mode. The Precision Mode provides the user with greater control, with a No-Mar pad and depth adjustment making it easier to get a consistent, quality finish. The new Dewalt DCN660 Nailer features an extended runtime compared to previous Dewalt 2nd Fix Nailers, capable of firing approximately 2200 nails on a single charge using a 5.0Ah Lithium-ion Battery Pack (around 800 nails using a 2.0Ah Lithium-ion Battery Pack). 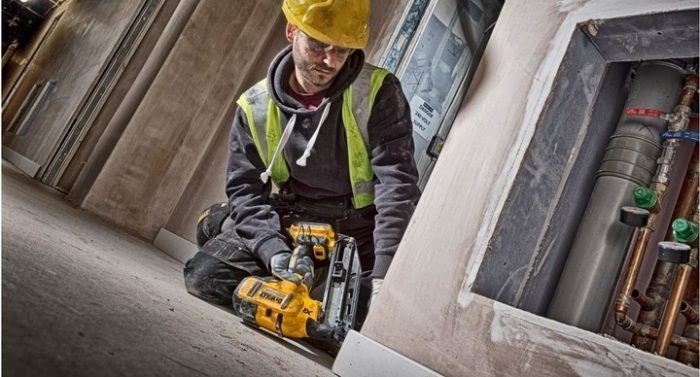 The new Dewalt DCN660 2nd Fix Nailer is designed for use with wooden materials – ideal for decorative trim applications such as coving, architraves and skirting boards. The ergonomic design and balance of the new DCN660 Nailer provides the user with comfort throughout the day, and the integrated belt hook is a useful feature for keeping the cordless power tool nearby and handy. The new Dewalt 2nd Fix Nailer is capable of driving nails up to 63mm in soft wood and up to 50mm in hard wood. The Dewalt DCN660N (body only), DCN660D2 (2x 2.0Ah Li-ion Batteries) and DCN660P2 (2x 5.0Ah Li-ion Batteries) versions are all in stock and available for free next working day delivery. As well as Dewalt Batteries and Chargers, we also stock the Brad Nails (sizes 32mm – 63mm) to go with the new Dewalt 2nd Fix Nailer. If you’ve recently purchased or tried the new DCN660 Nailer, let us know what you think of it on our Twitter page.